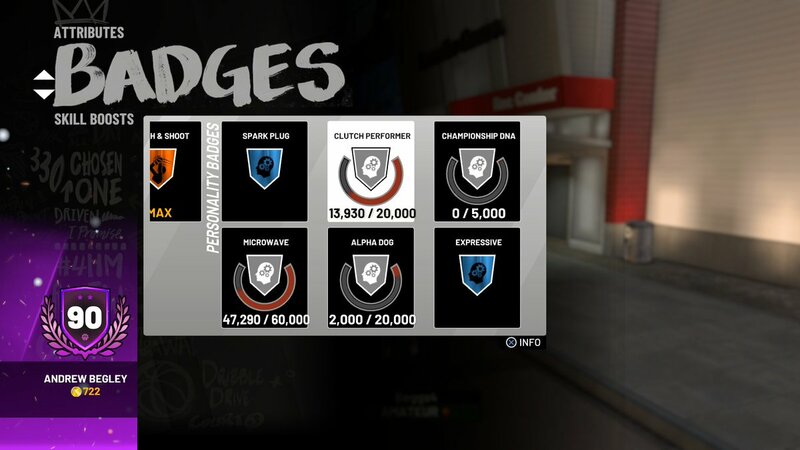 If you're playing MyCAREER and/or the connected online modes, what's your current progress on the Road to 99? Have you spent any money on VC or benefit from pre-ordering the 20th Anniversary Edition, or are you just grinding? I'm doing my best to avoid buying any VC this year, and so I'm grinding up the old-fashioned way. It's made the few online games the NLSC squad has played a bit more challenging for me, since I'm still a paltry 64 Overall. It hasn't been completely unbearable though, and MyCAREER itself is more enjoyable than in NBA 2K18. My original intention was to take a break from MyCAREER this year, so it's definitely been a lower priority, though the prospect of playing some games with the guys has encouraged me to consider grinding a bit. 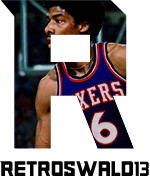 I've worked my way up to Sixth Man status through nine games, and have earned six Badges. Badge grinding is certainly less of a chore this year, too. 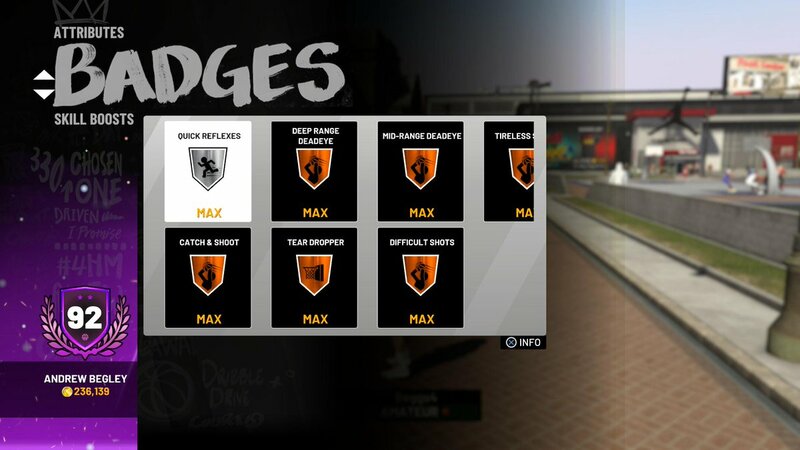 Haven't bought VC and never will but I'm at a 73 with almost all my badges on at least bronze with a couple on silver. Currently at 75 Overall, still no money spent on VC. I do actually have enough to go up to 78 Overall, but for the moment I'm just letting the funds build up so that I can make some significant upgrades and jump up to 80 Overall. I have a question. Unless you create a defensive player, how do you play defense? My friend has the game and he is a 90 rated player now, but defensively, even though he tries to play good defense and doesn't take a lot of chances defensively (steal attempts, etc), every player he defends scores 40 or more point per game. Even the bench players, on a per 36 minute basis, average over 40 PPG. The AI just completely attacks him since he isn't able to get around picks, but even if he does, his own teammates get in the way and block him out. Even if he has a hand in the face of the dude he's defending, they still make a ridiculous number of shots. So, unless you set up a defensive player from the get-go, exactly how do you make your player better defensively, especially since the AI's game plan is to attack the human player since the human can't move as quick, for one thing. I mean the guys he defends (starter plus bench player) are scoring over 40% of their team's points EVERY game. His player just isn't quick enough to keep up, strong enough to get around picks, or good enough defensively to stop players even with his hand in their face. This is in MyCareer (or 2k's career). Currently 91 overall. 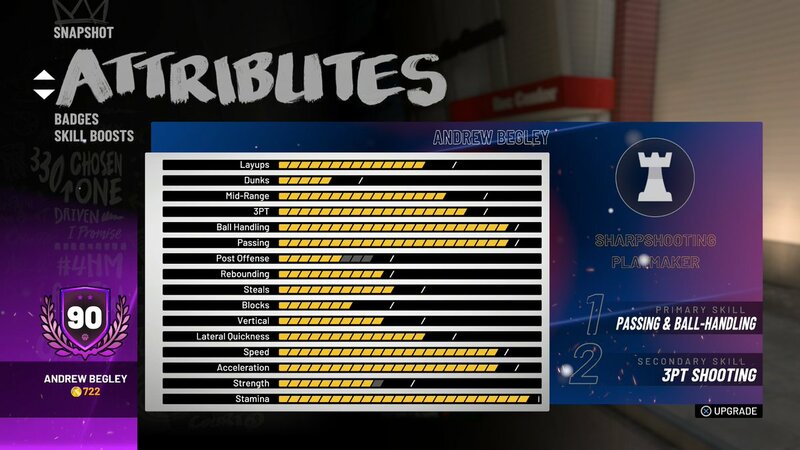 Didn't purchased any VC but need to grind more MyPoints to unlock the next set of attributes. This is the highest overall I attained in my 9 years playing NBA 2K. Nice work! Unfortunately I was having some Internet issues around the time of release, so there was a couple of weeks where I couldn't play anything with an online component as I didn't know if my connection would last two hours or two minutes. 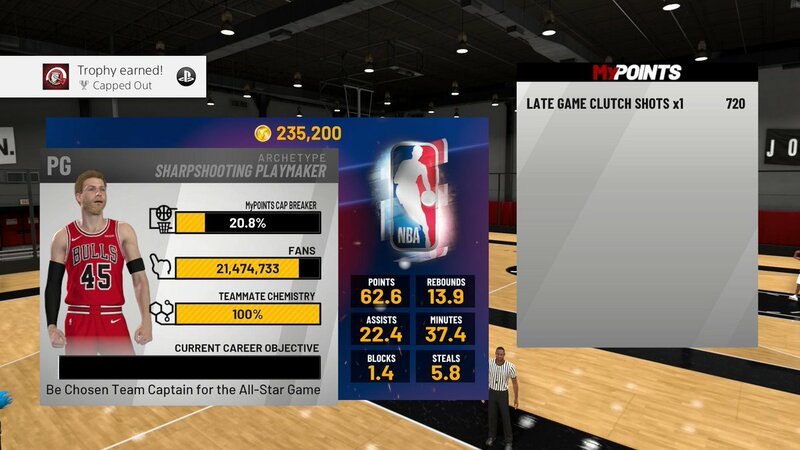 That was a set back as I couldn't do anything with my online/connected MyCAREER save for a fortnight or so, and have been playing catch-up since. My next Cap Breaker should get me to a maximum of 90 Overall, though hitting that will be a ways off yet. I did manage to get to 95 Overall back in NBA 2K17. I upgraded to 80 Overall earlier in the week, and am now 82 Overall as of last night. Some Daily Bonuses and the Free Throw Tournament helped build up my VC balance for some quick upgrades after the jump from 75 to 80, which cost around 50,000 VC. 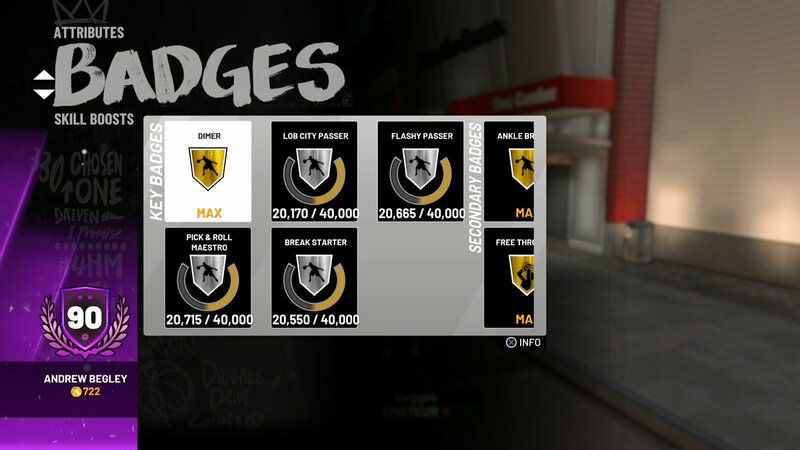 I might even be able to max out all my Badges this year as well. If only I could win the trivia jackpot. I came so close last week, but messed up on the last question. Still kicking myself for that one. Progress seems to be a lot quicker once you hit 80. I'm now up to 86 Overall, with only five Gold Badges left to max out, and about a quarter of the way towards doing so on each. 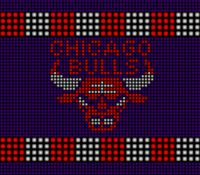 I need about 38,000 VC to hit the cap, which will get me to 90 Overall. Again, it's a long slog, but it does feel like an accomplishment doing it without buying any VC. I got sick of the grind because on PC online is full of hackers and is unplayable unless you use them yourself and offline I won MVP while at 70 overall so no need to grind just for that. I know what you mean. If the NLSC squad wasn't going to give team Pro-Am on PS4 a try in the new year when we've finally got five on a regular basis, I wouldn't be grinding as much. I haven't really put any time into MyCAREER on PC as I don't want to double up; I basically just played through The Prelude to get it done, try out a few different choices, and be able to skip right to The Neighborhood for screenshots and so forth. 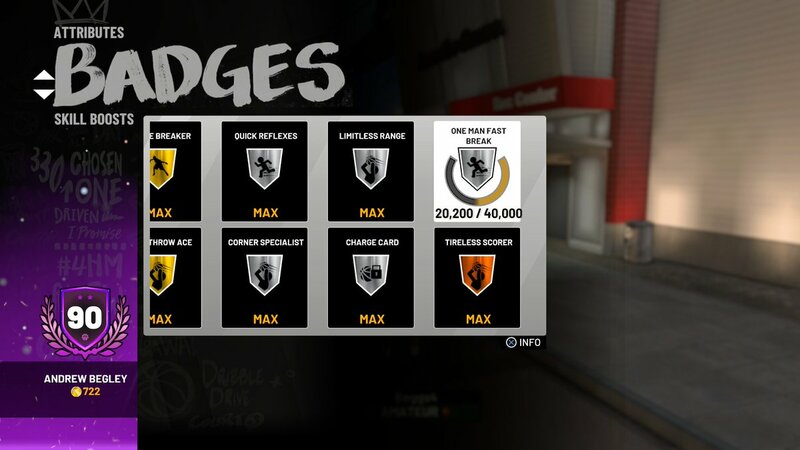 Finally hit 90 Overall, all VC earned in-game except for the 5000 VC pre-order bonus for the standard edition. About halfway to maxing out the remaining five Badges. Thanks! Now I can invest in some animations and clothing, as I should have plenty of VC saved up by the time I hit my next Cap Breaker. I've made it to 92 Overall, which means I no longer have to go to the Gatorade gym to replenish my boost. I really think they should do away with that mechanic in NBA 2K20, as it just adds tedious and repetitive busywork in between games. At least it's every five games in NBA 2K19, but it's still a hassle. 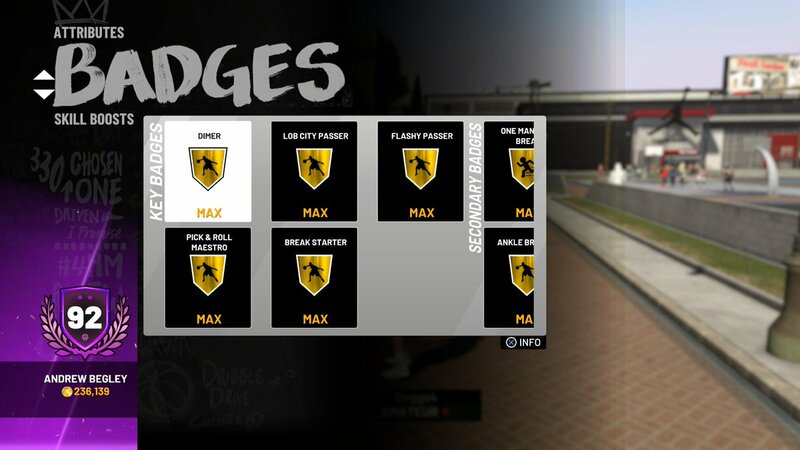 At the very least, the Gym Rat Badge should be a reward for a much lower tier, or earned through your actions. Finally got the Clutch Performer Badge, so the Capped Out trophy is mine, along with a full complement of maxed out Badges.